Remember the old saying, "A picture is worth a thousand words."? Well, maybe you don't and I am really showing my age, but the point is truer than ever today. This generation is by far the most visual there has ever been. Whatever the cause is, the fact remains, you should use visuals when you teach. A visual can be a simple prop, pictures, power point, puppets, a film clip or even (gasp) flannel-graph. 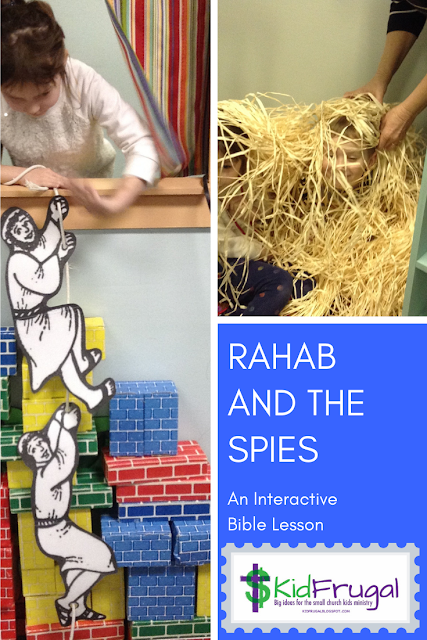 Pictures are especially important in helping children to understand Bible stories, because the context is often so foreign to today. Do they know what the tabernacle is, or the arc of the covenant or a ram's horn? Of course not. I have a whole pinterest board with ideas on how to visualize Bible stories. In this blog I want to focus on making your own pictures for flash cards. 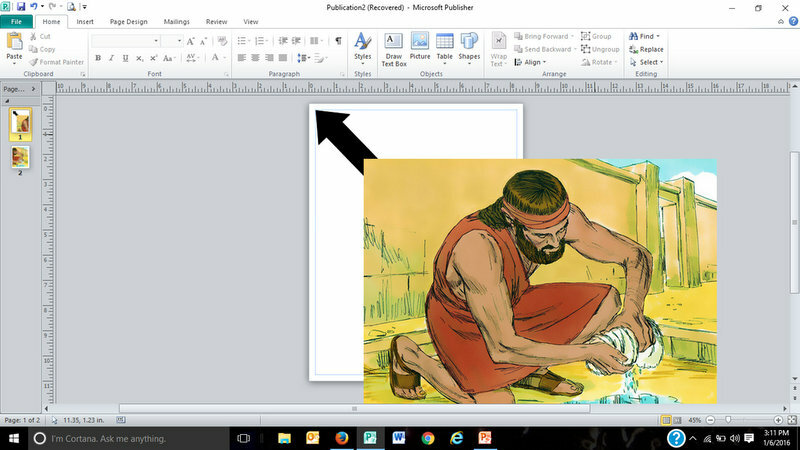 In another blog, I will show you how I animate Power Point Bible pictures to make them come alive for the kids. If you have under 20 kids in your program, I recommend using tactile visuals rather than digital when possible. Studies are beginning to show that tactile aids are retained better than digital ones. Don't believe me? Just google something like "touch versus digital" and check out the results. Here is just one article, Paper Beats Digital. 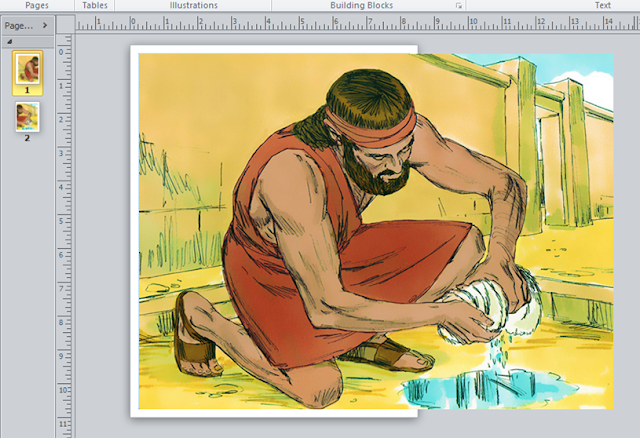 Sweet Publishing has 370 illustrations just from the book of Genesis. First, you need a good site to obtain your visuals. There are many out there that offer free pictures, but the two I go to most often are Free Bible Images and Bible Illustrations from Sweet Shores. Most of the pictures are the same on both sites, but there are some stories that I can only find on one or the other, so I use both sites. I make 11x17 pictures for my flash card stories. Our printer will not take that size paper (ledger), so I trick it. I use narrow margins and use the portrait setting. It takes 2 pages to make one picture. You are going to blow the picture up until it is 11 inches tall. This one came out about 11 inches tall by 14.5 inches wide. After you blow the picture up to about that size, paste the left 1/2 of it on page number one in Publisher. 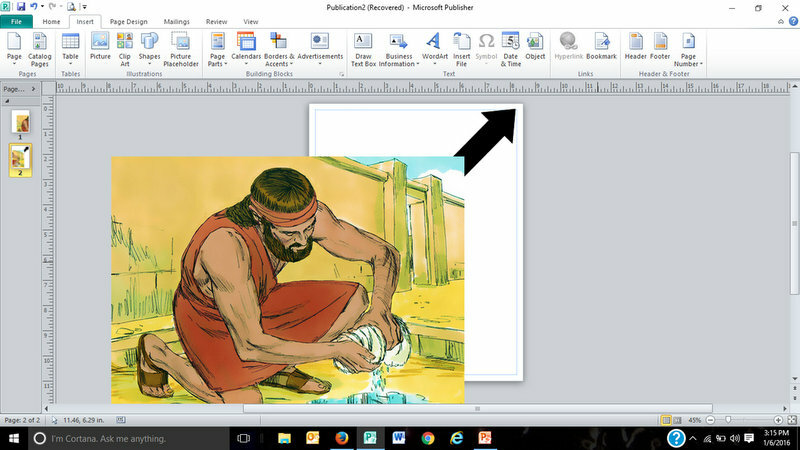 Take the same picture and paste the right 1/2 of it onto page number 2 in Publisher. I use white card stock for printing. You can slit the tape on the back (watch the instructable below), and fold these pictures up for easy storage in manila file folders. Flashcard stories work with smaller groups of children. If you have over 20 kids, I recommend going to Power Point. Storage of ledger size flash cards. from Joan Eppehimer on Vimeo.